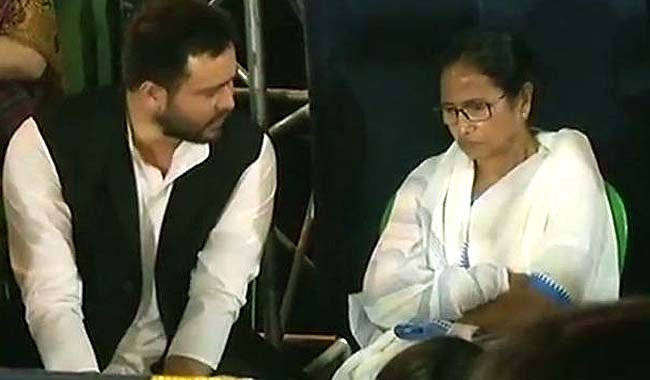 Kolkata, Feb 4 : RJD leader Tejashwi Yadav and DMK Rajya Sabha MP Kanimozhi arrived here on Monday evening to show solidarity with West Bengal Chief Minister Mamata Banerjee in her sit-in demonstration and accused the Narendra Modi government at the centre of misusing the central agencies to intimidate opposition leaders. Expressing strong support towards Banerjee's strong anti-BJP stand, Tejashwi Yadav, also the former Bihar Deputy Chief Minister, said all the opposition leaders should take such steps to save the nation and bring an end to the saffron outfit's oppression. "Everyone knows how strong Mamata Banerjee is. So BJP's strategy is to scare her, intimidate her. I congratulate Banerjee for the strong steps she has taken. If we want to save our country, then all the leaders must take such strong steps. Otherwise they (BJP) will try to oppress everybody," he said while standing beside Banerjee on the dais. "They (Centre) are sending the CBI after Akhilesh Yadav and ED after Mayawati in Uttar Pradesh after their alliance was announced. They are also after Banerjee and (Andhra Pradesh Chief Minister) Chandrababu Naidu. They put my father in jail as he did not compromise with communal forces and started police cases against our entire family," said the son of RJD chief Lalu Prasad. He accused the BJP-RSS of not having any regard for Indian constitution and said that the 2019 election will an ideological battle. "The people who are in power now, the BJP-RSS, had no contribution in India's freedom struggle. They always aided the British. They do not believe in our constitution. We do not have any personal fight with Narendra Modi. It is an ideological fight," Yadav said. DMK leader and party president MK Stalin's sister Kanimozhi also extended her support to Banerjee and claimed that the Trinamool chief is under attack by the BJP government for successfully conducting the anti-BJP rally in Kolkata last month. "We stand against the fascist BJP government. Today, this is a pre-election gift from the Modi and BJP government to her for having very successful rally on January 19. After the rally, they realised they are not going to win a single seat from West Bengal. We stand by her and say that we will be together," she said. Kanimozhi also claimed that the Modi government is mistaken if it thinks that it would be able to create a divide amid the opposition by trying to harass and intimidate them using the CBI.